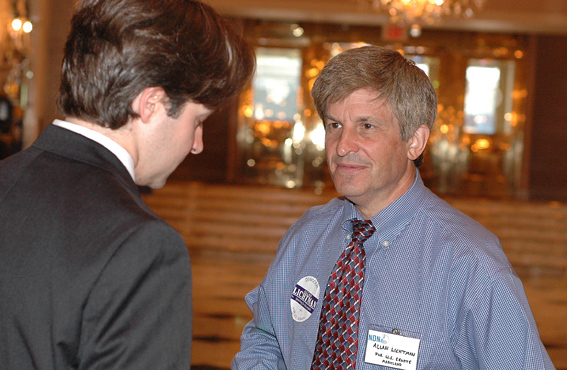 June 22 and 23, 2006-Allan Lichtman, a candidate for the Democratic nomination for U.S. Senate in Maryland, pitched his campaign to attendees of the NDN 2006 annual meeting. 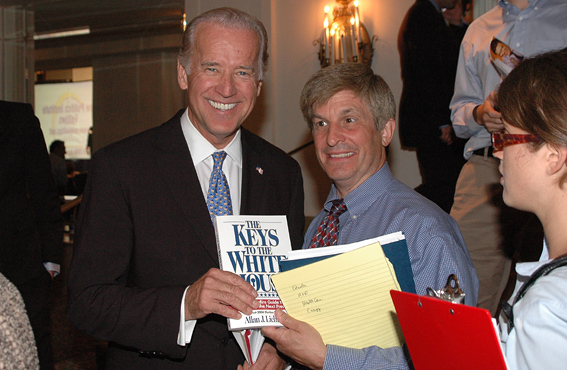 Lichtman, a History professor at American University, also presented copies of his book The Keys to the White House to former Gov. 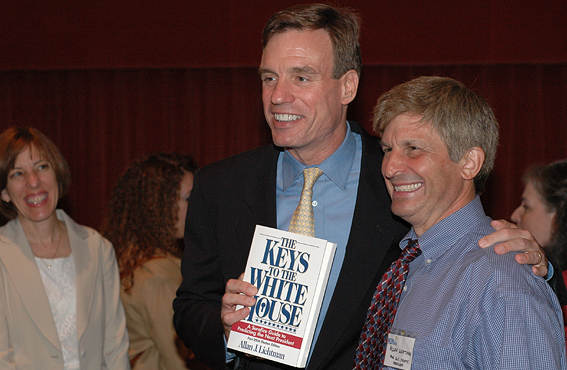 Mark Warner, Sen. Joe Biden and Sen. Hillary Rodham Clinton (no photo; she quickly handed the book to an aide). Allan Lichtman: I have been forecasting presidential elections since 1984, using my unique system called "The Keys to the White House," which are 13 key indicators indicating whether or not the party in power will win or lose. It does the national popular vote, not individual states, and it's not been wrong since 1984. And right now it looks like a sea change is sweeping across the presidential landscape that will bring the Democrats back to power in 2008. What has changed since 2004? Number one, it's an open seat, so there will not be a sitting president up for re-election. Number two, it's likely that the party in power is going to have a big donnybrook of a battle for the presidential nomination, another negative factor for the party in power. Number three, it doesn't appear as though the party in power has a truly charismatic, transcendental figure like Ronald Reagan. And it looks like the party in power is going to lose seats in the midterm election. So these are factors that are beginning to change the political landscape and point the way to a Democratic victory regardless of who the Democrats pick for their nominee. And by the way, throughout 2004, I continued to maintain that based on the keys, the Democrats could not win this election following the conventional politics that they were maintaining. I wrote two articles in The American Prospect, I wrote articles in Common Dreams, on Counter Punch, and did numerous commentaries on CNN. QUESTION: Have you modified your keys since you first introduced them? Allan Lichtman: No the keys have been as constant as the Northern Star. They've not changed since I first predicted Ronald Reagan's 1984 re-election, which I predicted in an April 1982 article in the Washingtonian magazine called "How to Bet in '84." QUESTION: I think there was one asterisk to your record of success, which was the Gore...? Allan Lichtman: Well in 2000 of course, since I only predict national popular trends, I can't tell you what's going to happen with 537 votes in Florida, so indeed I predicte Al Gore, who did win the popular vote, but for the first time since 1888 the winner of the popular vote lost the Electoral College vote. QUESTION: Talk a bit about your race for Senate. Allan Lichtman: I'm running for the United States Senate in the Democratic primary in Maryland. I had briefly explored a candidacy about 20 years ago for Congress in the 8th Congressional District in Maryland, but decided the incumbent was too entrenched, so this is my first full blown run for the United States Senate. I love getting out an meeting the voters. I not only go to events and speak, I'm at Metros, I'm at fairs, I'm in the Inner Harbor of Baltimore, I'm hand-waving to ongoing traffice early in the morning, and that's been wonderful. What I find of course is the difficult part of campaigning, when you're not the inside candidate, is gaining the establishment's attention. I would have thought after the Democratic party's inside strategy had utterly failed it since 1994, that the party would be a little more open than it has been to new ideas and a candidate who's not tied to the old ways.